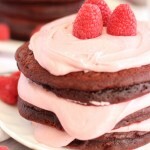 With a hint of cocoa, and a touch of vanilla, this Baked Red Velvet Donut Recipe will be a hit with your Valentine. Topped with tangy cream cheese icing, these moist buttermilk cake donuts are impossible to resist. I’ve eaten two of these today so far, and I’m working on my third. These definitely fall under the category of “addictive” foods. 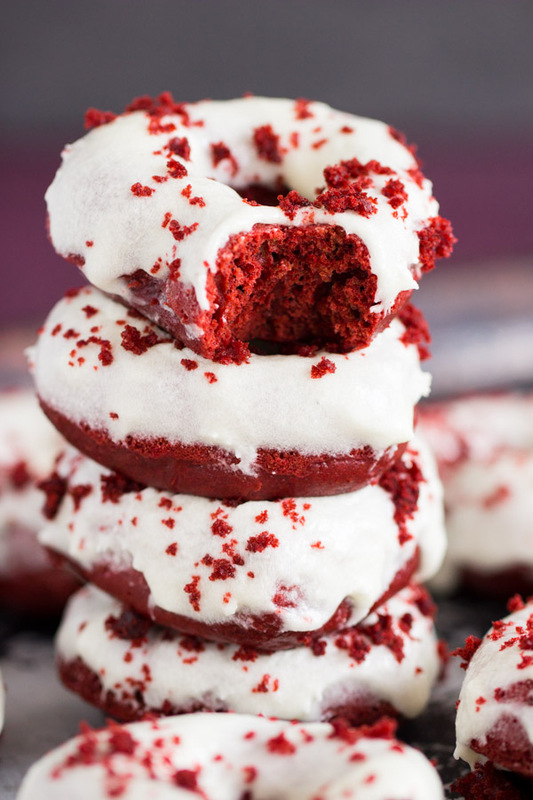 I am a sucker for red velvet things anyway, and as I’ve said before, donuts would be my desert island food. 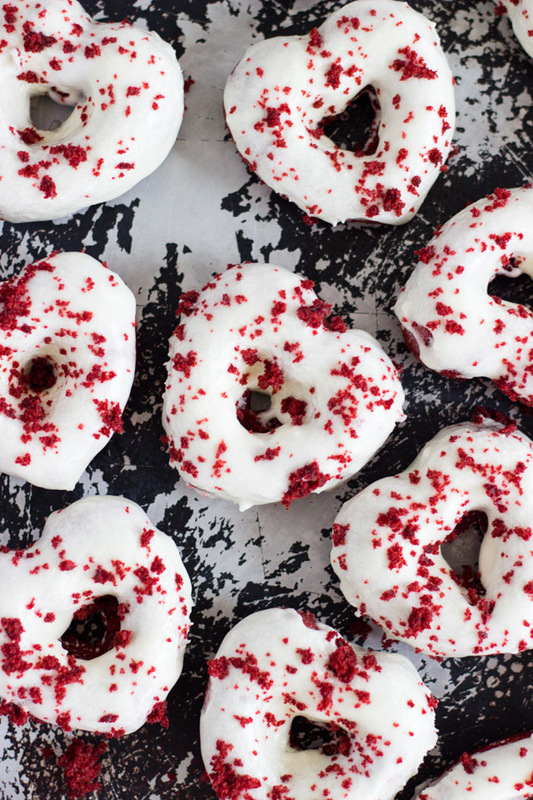 So when donuts meet red velvet, it’s quite a match made in heaven. 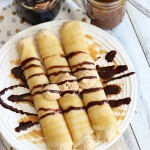 You should make these for YOUR match made in heaven for Valentine’s Day. 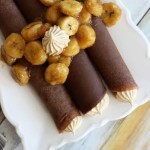 They can be brunch, or they can be dessert. I think you can get away with donuts for dessert when they’re this delicious and pretty. 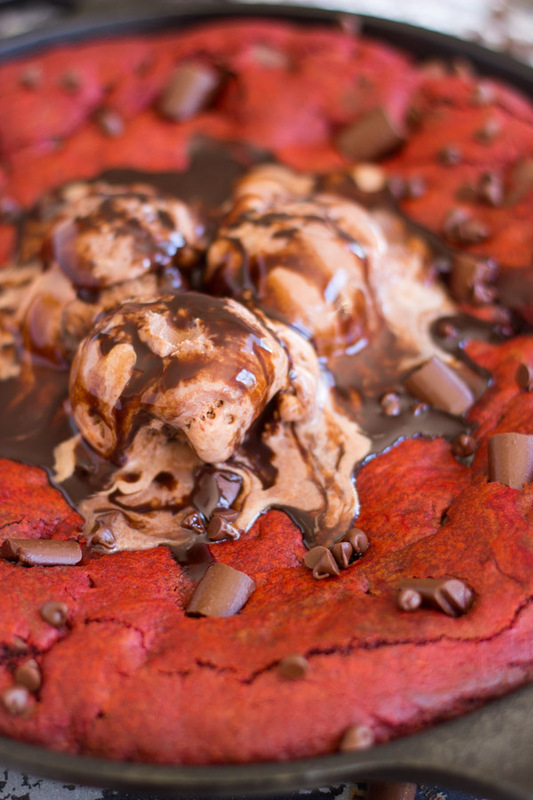 Red velvet is such a fun dessert flavor because it’s part vanilla, part chocolate. It’s a little bit of both. It’s lighter than milk chocolate, but with vanilla too. 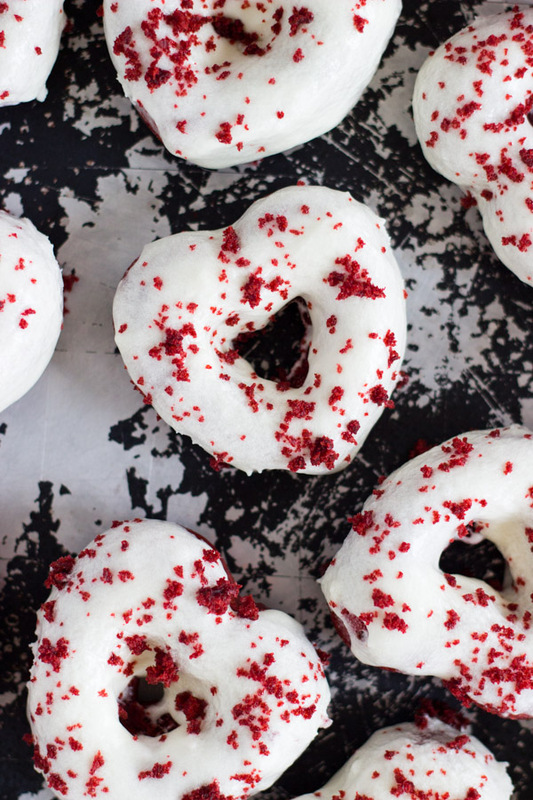 These baked buttermilk donuts are flavored with classic red velvet. 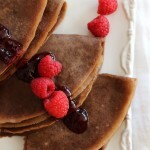 A hint of cocoa in an otherwise vanilla-y dessert. Plus a boatload of red food coloring. They’re moist and dense, like a good cake donut should be. And because they’re baked, they’re a hell of a lot less work than a fried version, and a hell of a lot less calories too. 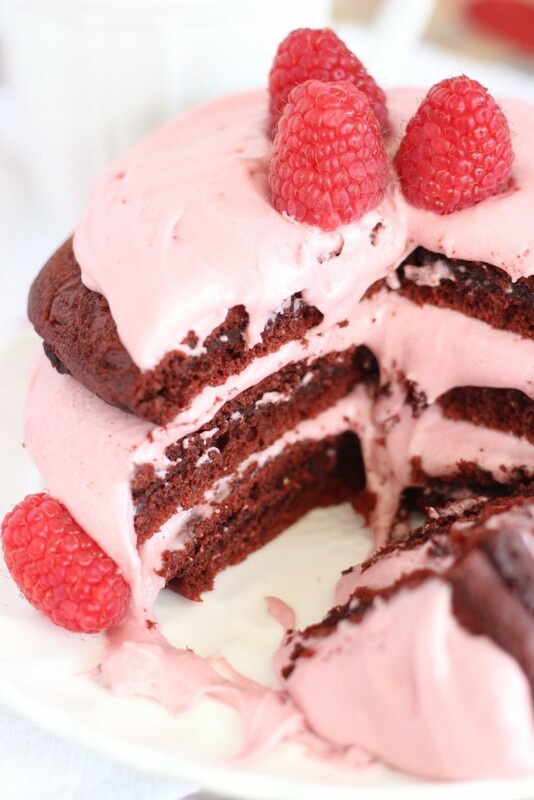 What pairs better with red velvet? Tangy and creamy cream cheese icing. It’s thicker than a glaze, but not quite as thick as buttercream. The consistency is just right for dunking donuts. The icing sets, coating all the donut’s crevices, but it doesn’t drip off. You don’t want to lose a drop of it, so this is a great thing. 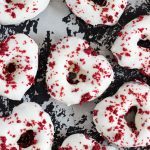 I used this Heart-shaped donut pan (affiliate link) and these donuts are totally adorable, and definitely convey a Valentine’s Day theme, but you could use a regular donut pan too! Don’t say I didn’t warn you about their addictive properties. 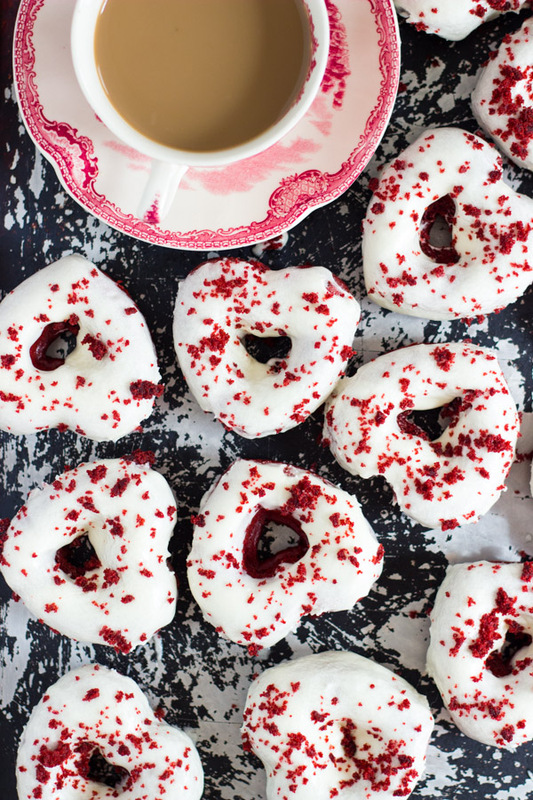 With a hint of cocoa, and a touch of vanilla, these red velvet donuts with cream cheese icing will be a hit with your Valentine. 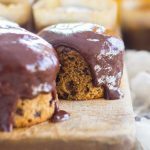 In a large bowl, whisk together flour, cocoa powder, brown sugar, salt, and baking powder. In a medium bowl, whisk together buttermilk, melted butter, vanilla, eggs, and food color. Add the wet ingredients to the dry ingredients, and stir until just combined. Do not overmix. Lightly grease regular-sized donut pans, or heart-shaped, if you have them! Pour the batter into a gallon-sized plastic bag, and snip the corner. Pipe the batter into the donut cavities, filling them about 2/3-full. Bake at 350 degrees for 10-12 minutes, or until donuts spring back when lightly pressed. In a large mixing bowl, beat cream cheese and butter until creamy. Add vanilla, powdered sugar, and milk. Beat for 2-3 minutes, or until thick and smooth. 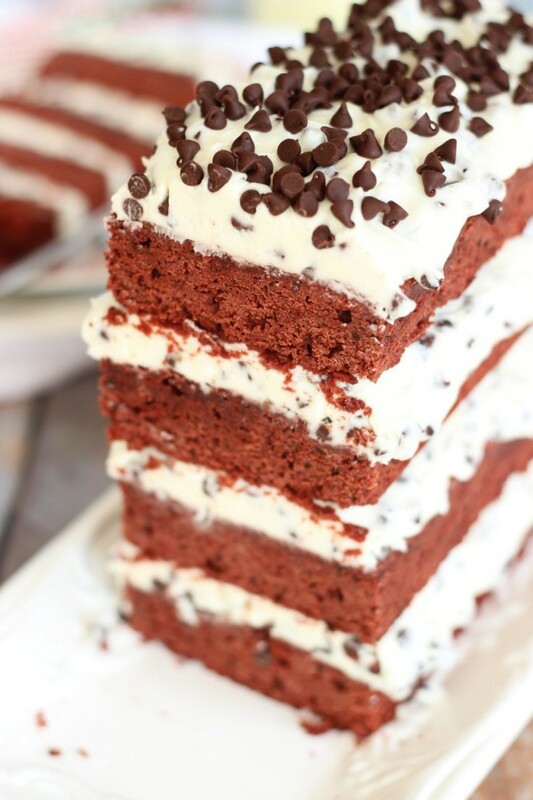 Icing should be thicker than a glaze, but thinner than buttercream. You want the consistency to be such that you can dunk the donuts into it. Add more milk, if needed, to achieve this consistency. 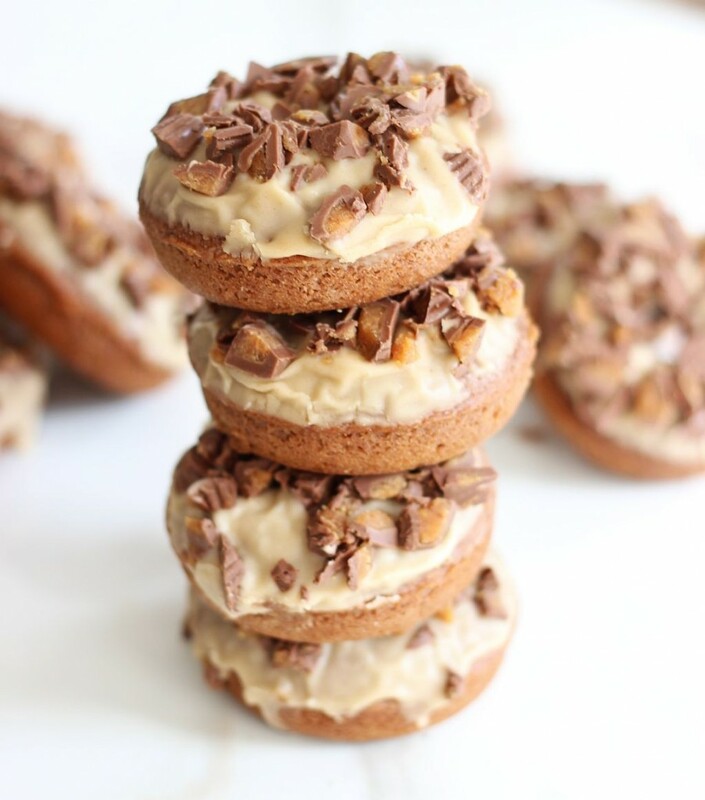 Dunk donuts in icing. Return to wire racks to set. 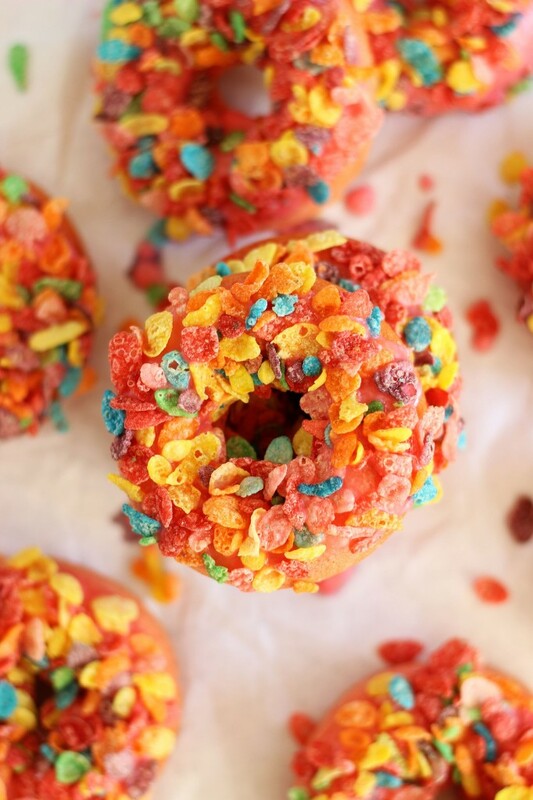 If desired, crumble up one donut, and sprinkle the crumbs onto the other donuts for garnish. Adapted by Baker by Nature. 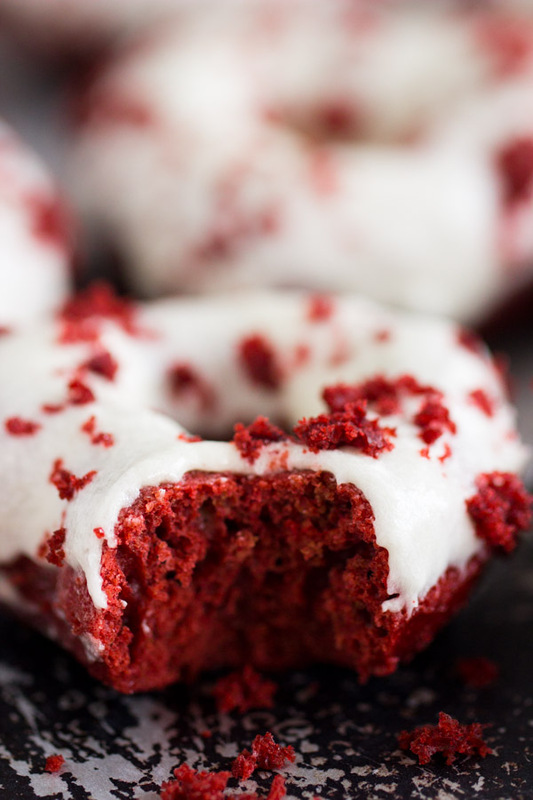 wow, I really Appreciate your Red Velvet Doughnuts Recipe. thanks for sharing with us.I hope you like mine too..